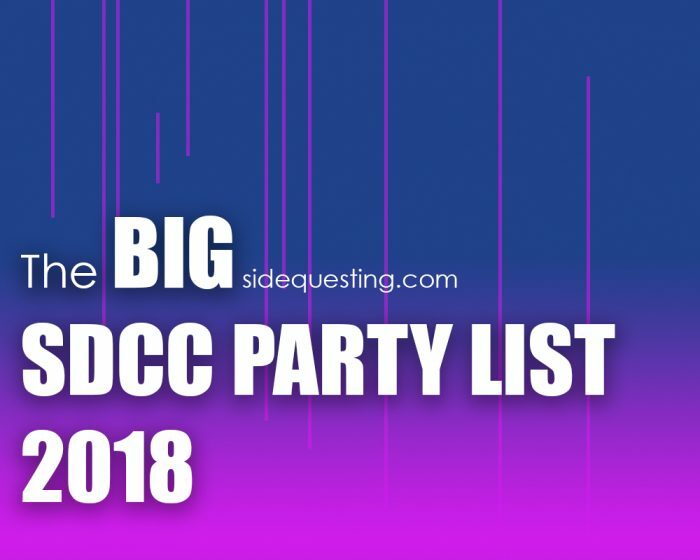 Home » Event » The 2018 SDCC Party List – Parties, events, concerts and more! Ayyyyy herrr we go! 2018 edition! Whether you’re in town for comic books, movies, video games, cosplay, or whatever else, SDCC has an awesome after-event nightlife you should be checking out. We’re here to help you find it! Join us EACH HOUR as we’re adding TONS of events during the Con! As usual, the FACEBOOK GROUP is our partner in good time, so make sure you head there for coordinating with friends and meeting new peeps! And again, MASSIVE thanks to Andie and Dali! Sit back, enjoy the list, plan your partying and we’ll see you there! Keep coming back daily, as we’ll be updating this list FURIOUSLY and OFTEN! Comic Con Trivia! Free to Play – 8-10PM @ American Junkie San Diego, 628 5th Avenue, San Diego, California 92101 – RSVP: Free Entry! – Info: Free Trivia Event for Comic Con. All trivia questions will be on Comic Con related topics!! 2 Blog 2 Furious – 6-9PM @ McFadden’s San Diego, 731 5th Ave, San Diego, California 92101 – RSVP: Free Entry, all ages before 9 – Info: Facebook | Stop by and say hi to the UBlog crew and fellow readers, have a drink, grab a bite to eat, and just have fun! It’s a great alternative to Preview Night, or a perfect cap to your evening. KWF at KAVA: Con Kickoff Party – 6PM-12:30AM @ Kava Lounge, 2812 Kettner Boulevard, San Diego, CA – Tickets: $15 | BUY HERE – Info: Facebook | KWF Comic Con 2018 Preview Night Underground Kick-off Party! Ditch the corporate Con party scene and join KWF at a locals’ nightclub for an underground party vibe in support of a great cause! Ready PARTY One SDCC Preview Night Party – 8PM-12AM @ Fluxx, 500 Fourth Ave, San Diego, CA 92101 – Tickets: $25 & UP | BUY HERE – Info: Facebook | Damn Good Shindig will create an immersive experience into The Oasis to accent this nostalgic journey through musical time and space. Get your photo with a RPO mod Delorean parked out front or Bill & Ted’s time traveling phone booth, test mixed reality gaming, and take part in our interactive Gunter Challenge all evening! FXhibition – 12-6PM @ Hilton San Diego Bayfront, 1 Park Blvd, San Diego, CA 92101 – RSVP: Free | Register Online – Info: Immerse yourself in the FXHibition, a celebration of FX’s hit series through a lens of art & technology. Events daily. Closet SMASH! presented by Skybound & Geeks OUT – 1:30-5PM @ Harbor House Restaurant, 831 W Harbor Dr, San Diego, California 92101 – Tickets: Eventbrite | BUY HERE – Info: Join your friends from Geeks OUT and Skybound Entertainment for Closet SMASH! An afternoon of queer community, refreshments, delights, and DANCE No SDCC Badges Required! Alpha Book Club Happy Hour – 7-8PM @ Sparks Gallery, 530 Sixth Ave, San Diego, CA 92101 – RSVP: Free Entry! – Info: Join Maude Garrett, Hector Navarro, and Rachel Heine for a glass of wine with the ABC gang! Alpha Book Club Happy Hour is free and open to the public, Alpha members will receive exclusive Fast Pass and Priority Access wristbands. Alpha After Dark Party with The Kraken Rum – 9PM-1AM @ Fluxx, 500 Fourth Ave, San Diego, CA 92101 – RSVP: Invites are limited to Alpha members; non-members can sign up for Alpha at www.projectalpha.com – Info: Alpha & The Kraken Rum return to San Diego Comic Con for their exclusive Alpha After Dark Party. Alpha members will enjoy a curated evening of music by DJ Franki Chan of IHEARTCOMIX, the opportunity to receive personalized Kraken-inspired portraits by famed graphic artists Tom Hodges and Tony Parker, and custom signature Kraken Rum cocktails! Fans will want to attend the party to see what The Kraken unleashes at SDCC this year! SDCC Meetup + Trivia Tournament – 7:30PM @ The Tipsy Crow (upstairs Lounge floor), 770 Fifth Avenue, San Diego, CA 92101 – RSVP: Register Here – Info: If you want to enter our Trivia Tournament for a chance to win swag bundles of Space Snoo branded items and collectibles, be here early. We’ll start quizzing around 8:15PM in the upstairs Lounge and space is limited! After-Con with Game of Thrones’ Kristian Nairn – 9PM @ Omnia Nightclub, 454 Sixth Ave, San Diego, CA 92101 – Tickets: $25 & Up | BUY HERE – Info: Doors open at 9:00PM. All sales are final. No refund. No exchange. No cancellation possible. 21+ with valid photo ID. Throwback & Dance – 9PM @ BASSMNT Nightclub, 919 Fourth Avenue, San Diego, CA – Tickets: $30 & Up | BUY HERE – Info: Pastel up your cosplay and throw on those slap-braclets to join SUPER NEWS, THE MACHINE, FAN GURU and THE GEEK GATSBY as they take you back to the 90s for a night of totally rad dancing featuring revved up funky DJ sets by RPM and RUFIO himself, Dante Basco! FXhibition – 10AM-6PM @ Hilton San Diego Bayfront, 1 Park Blvd, San Diego, CA 92101 – RSVP: Free | Register Online – Info: Immerse yourself in the FXHibition, a celebration of FX’s hit series through a lens of art & technology. Events daily. National Geographic’s Nerd Nite Party – 8-11PM @ Solamar Terrace & Pool at the Hotel Solamar, 435 Sixth Ave, San Diego, CA 92101 – RSVP: Free Entry! – Info: Nat Geo & Nerd Nite are back again at Comic-Con San Diego to take you 34 million miles from Earth and 24 years into the future to reach Mars. Join us for FREE FOOD AND DRINKS that are out of this world! Trade in your Earthling citizenship and become a Martian as we celebrate the second season of MARS, premiering this November. Robo Rhythm: An Intergalactic Dance Party hosted by Legendary Television – 10PM-1AM @ Oxford Social Club, 435 Fifth Ave, San Diego, CA 92101 – RSVP: Invite Only! – Info: In partnership with Nerdist, Legendary Television is hosting “Robo Rhythm,” an intergalactic dance party celebrating LOST IN SPACE at the Oxford Social Club. Guests are invited to enjoy cocktails at the open bar featuring Don West smuggled booze, while dancing to a one-night-only special guest DJ set by the LOST IN SPACE “Robot.” Private invite-only party. SYFY Fan Party @ New Children’s Museum, 200 W Island Ave San Diego, CA 92101 – RSVP: Invite – Info: Come party with your friends at SYFY! Digital LA – Comic Cocktails (2018) – 6-9PM @ Origin Code Academy, 350 Tenth Ave, Suite 900 San Diego, CA – RSVP: FREE | Eventbrite – Info: Join us for our 10th annual Digital LA – Comic Cocktails during San Diego Comic-Con. Enjoy panoramic views of Petco Park, Downtown San Diego, and the Coronado Bridge from the Origin Code Academy’s 9th floor offices. Bizarre States 200th Episode Party hosted by Jessica Chobot and Andrew Bowser – 8PM-12AM @ Sparks Gallery, 530 Sixth Ave, San Diego, CA 92101 – RSVP: Alpha members and invite-only industry and talent. – Info: Party with Jessica Chobot and Andrew Bowser! Celebrate the 200th episode of Bizarre States with music from Nerdist House DJ, food, beverages, and more surprises thematically inspired by the show. Bizarre States 200th Episode Party will be open to Alpha members and invite-only industry and talent. SYFY Harry Potter Fan Party @ New Children’s Museum, 200 W Island Ave San Diego, CA 92101 – RSVP: Invite – Info: Come party with your friends at SYFY! We Are Negan – 12-3PM @ Harbor House Restaurant, 831 W Harbor Dr, San Diego, California 92101 – RSVP: Free – Info: Facebook | Calling all fans of Negan and The Walking Dead… come dressed as the character, win prizes, and more! Stan Bush w/Special Guests – 7PM @ Brick by Brick, 1130 Buenos Ave, San Diego, CA, 92110 – Tickets: $15 | BUY HERE – Info: Stan Bush is the Emmy Award winning singer/songwriter famed for his worldwide hit “The Touch.” Regarded as a trailblazer of Melodic Rock, his songs have appeared everywhere from movies to TV to video games. Cosplay X Sabbat – 9PM-2AM @ The Merrow, 1271 University Ave, San Diego, California 92103 – Tickets: $6 at door – Info: Facebook | Hosted by Robin Roth (KFM-BFM, Sabbat, Ascension, Hemlock) Your Sabbat Go Go ghouls. Cash prizes for the best costumes. BUMP presents Rocky Horror Disco Show w/ Tiago Miranda (Lisbon) – 9PM-2AM @ Blonde, 1808 W Washington St, San Diego, California 92103 – Tickets: $6 Early Bird | BUY HERE – Info: Facebook | Saturday 7/21 we will transform Blonde Bar into scenes straight out the beloved film — sequins, velvet, gold lame, moist red lips, fishnets, a costume contest, a lot of sweaty mascara, a lot of costumes (we suggest you roll that way too but not required), a timewarp or two, and many more RHPS surprises. Buff The Vampire Slayer Vampire Hunt at San Diego Comic-Con – 12-5PM @ Gaslamp District & Comic Con – RSVP: FREE | Register Here – Info: Facebook | Every fan becomes a slayer as they must locate each ‘Vampire Nest’ across the Gaslamp District and throughout San Diego’s Convention Center. At each location, fans will be rewarded with a wide-range of prizes including Buffy Funko figures, posters, stickers, pins, t-shirts, comics and much more. FXhibition – 10AM-2PM @ Hilton San Diego Bayfront, 1 Park Blvd, San Diego, CA 92101 – RSVP: Free | Register Online – Info: Immerse yourself in the FXHibition, a celebration of FX’s hit series through a lens of art & technology. Events daily.